A Connecticut teen who moved to the U.S. without most of his family worked 40-hour weeks to send money to his mother in Guatemala. 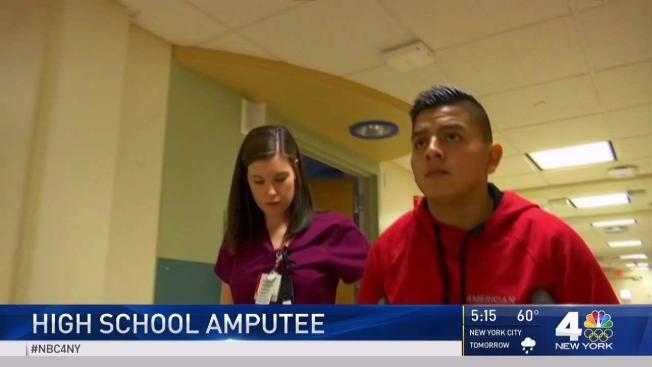 Now the honor student is facing a challenge he never imagined -- he had to have his leg amputated after an accident on the job. Ida Siegal reports. High school senior Erwin Hernandez moved to the U.S. without most of his family, working 40-hour weeks to send money to his mother in Guatemala. Now the honor student is facing a challenge he never imagined: He had to have part of his leg amputated after an accident on the job. The day after Christmas, Hernandez was working a shift at Table 104 in Stamford, Connecticut, when a car slammed into the restaurant, trapping him. "I was screaming, yelling, that I need help," he said. "I get trapped in the wires. And when they take me out, I don't remember anything." Hernandez's world was suddenly flipped upside down. Doctors amputated his right leg above the knee. With most of his family back in Guatemala, the hard-working 18-year-old was left to deal with the tragedy on his own. "One of the things that make me sad, I don't have my mommy here, first," he told News 4 at the hospital where he's recovering. "And second, I don't have my leg, and I can't explain that feeling. But I just, when I am alone, I turn to cry, because it's really sad." But the teen who loves soccer and dreams of going to law school has already proven he can persevere through hardship. Hernandez moved to the U.S. just two years ago, and in that time, he's learned English, gotten into the National Honor Society and works 40-hour weeks to send money home to his mother. His teachers at Stamford High School call him a dream student. "He is somebody who has had more than his fair share of challenges put in his way," said teacher Kristi Lawson. "Every time he's had a challenge, he's not only met it -- but come out better for it." Hernandez is aiming to get a prosthetic leg fitted in a couple of weeks, then he'll have months of therapy. He's also determined to get out of the hospital room, go back to school, graduate on time and maybe even go to senior prom. "He needs to relearn how to walk and manage using muscles that he probably hasn't used before in this capacity," his doctor said. Physiatrist Dr. Carolyn Casino said Hernandez is "young, he's healthy, and he's strong. He's doing remarkably well." In the meantime, he has gotten a flood of support from teachers, students and his former boss -- a cheering squad who look to the teen as a source of inspiration. "Even though his life hasn't always been the easiest, he makes sure that everyone else is happy and that they have everything they need," said friend Ashley Alfaro. "And now that he's in the time of need is when everyone else is here for him." Hernandez says he's thankful for his support network. "Those people are the people who make me strong mentally and emotionally, and I am thankful for that," he said.